Pleco Wont Eat? 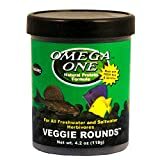 Stopped Eating Algae Wafers? Topic: So my Mollies have been nibbling at my pleco’s algae wafers a lot recently and I’m worried that my pleco is not eating enough. He’s been acting a little weird since I’ve noticed the other fish eating his food, flipping over on his back a lot now and just a general apathy. I don’t want to see him get outcompeted by the other fish, does anyone have any idea what I can do to help him? Feed him zucchini, cucumber at night after lights are out. Cut a piece, stab with a heavy fork and sink. I rarely give my pleco anything to eat and my tanks in my basement so not much algae I do have waffers for him but he seems to be doing just fine plus he gets every inch of my 90 gallon at night and I can tell by his poops hes getting enough to eat very hard to kill them food wise might be something else. I just think they love the variety. I have almost 80 baby albino bristlenose plecos and am feeding a wide variety of things. They even love fresh mushrooms. So do the adults. I’m in the states ur moneys not too different is it lol I live like 2 he’s from the Canadian border in north Dakota actually Canadians flood our cities to shop all year round. Veggie clips for fish tank will help hold zucchini in place. I bought mine at Petsmart but they are sold almost everywhere. I hope this helps. Here is my pleco dining on some zucchini. i stick a butter knife or fork in it to keep it at the bottom and then i feed everyone else leaving him to eat his dinner in peace. I still give him algea wafers every second day and he just waits his turn then he dives on them. Once he starts eating everyone else just leaves him be. I have a 5 yr old sailfish pleco and he’s not eating anything except blood worms. When he turned 2, he decided he would only eat zucchini and would throw a fit when I put anything else in there. So, I’m assuming he needs protein now. He won’t touch shrimp. What else can I give him and how many times a week can he have bloodworms? Anyone else have such a demanding pleco, lol? So how do I know if a pleco is getting enough to eat or not? I see him swimming around at night but when I drop food in he just ignores it and sticks his face to the glass. What are you feeding them and what species? I’ve never had a pleco I couldn’t visually watch eat and the ones I didn’t see eat didn’t last long. Check to see how thin he looks compared to photos you’ve seen. I tried brocolli, kale, algae wafers. Took no interest to any of it. It’s a BN pleco. Only had it a week so far though. it’s probably not used to it’s tank and only feeding at night. I’d try a slice of cucumber and check on him a while after lights out and see if he’s on it. That’s when I fed him, problem is all my other fish also eat at night so no food will sit long enough for him to decide to eat. Do you have real driftwood in the tank? They require a lot of fiber and will rasp wood to supplement. I have many different sinking foods for my bottom feeders. I buy several types and mix them up. Because they eat mainly at night, I feed them before I go to bed. To date, I have never had an ancistrus, pleco, or cory starve themselves unless they were ill.
My fish LOVE Repashy food. I make that for them as well. I also have many different foods, I’ve only had him a week so far so maybe that. Sits in one spot during the day and doesnt move. Swims around the glass when the lights go out. I do have diatoms but idk if that would be enough because it’s like 5 inches long. It took my pleco MONTHS to eat with everyone else. Now he’s super social though. I’m going to echo the cucumber plan. I’ve seen a few pictures of cucumber rounds on skewers/forks so maybe you can put one right by your pleco’s favorite cave to make sure it’s eating. Lol the problem is the pleco isn’t the only bottom feeder. I also have 3 dojo loaches who are voracious eaters. So nothing I put in the tank is gonna sit there till it decides to eat. Its gonna need to be a bit more proactive. Still cant get my new pleco to eat an algea wafer…I havent tried anything else cause im not sure what else to try…I will go buy a cucumber to try that but is there anything else i can do? he just sits hiding behind my anachris and moves like 1 inch every now and then. Hes a Golden Nugget Pleco. I dont wanna wake up and find him dead one morning so i need ideas!! The tank is 78 degrees and ill be honest i dont have a test kit right now…somehow i lost it and cant manage to find it so im in the works of trying to get a new one. The filtration and stuff i have is a marineland penguin back filter on the left side of the tank and a sponge filter on the right side of the tank and a bubble wand in the middle of the tank. I do a 35% or so water change every week. I only have 2 fish. A 1.5 inch Green Terror Cichlid and the Pleco. The tank was running with a in fish cycle with a couple goldfish for a month and a half or so and then i moved the goldfish to my outdoor pond and moved these guys in to this tank as they came in the mail. The green terror looks SO much better since the day he arrived and eats like a pig but i got the pleco 3 days ago now and nothing yet. Still barely see him move 1 inch from the same spot. My tanks plants and everything are thriving i just wanna get this pleco to eat something, hes my only problem. This is basically what plecos do. They don’t run to eat like regular fish. Others will have more input. my old bristlenose plecos i used to own would go CRAZY for algea wafers and would go all the way from one side of the tank to the other just trying to find it if i hid it from them. :/ thats the only reason im worried. I have a bristlenose I rarely see. Unless you see actual signs of stress in the fish I would assume it is fine. Gold nuggets don’t eat algae wafers. At least mine never did. I feed him Repashy Soilent Green. It simulates their natural food the best. They are grazers who rasp surfaces of rocks for food. The word is aufwuchs I believe. The pleco might still be adjusting. I’ve found that when I add a new pleco it will take them about a week before they feel comfortable. Is the green terror terrorizing him? For feeding, try feeding the pleco with the lights off, that might help. The green terror is smaller than him and they get along really well, i tried feeding with the lights off last night but nothing was touched and he barely moved by the next morning. will do, im just scared he will be dead one of these times when i wake up from him not eating or something… he was 70$ so i would hate for him to just pass away. Golden nuggets like protien rich pellets. Mine will take shrimp pellets over algae wafers all day. Some plecos such as golden nuggets need protien. All life needs protein. But u can try and stick the wafer to the glass somewhere where he is sure to pass.